Gallery, Latest News, Now What? NAFTA Has Harmed California Workers & Farmers, But More Accountability Needed in the Renegotiation Process, Say Labor, Environmental and community leaders. 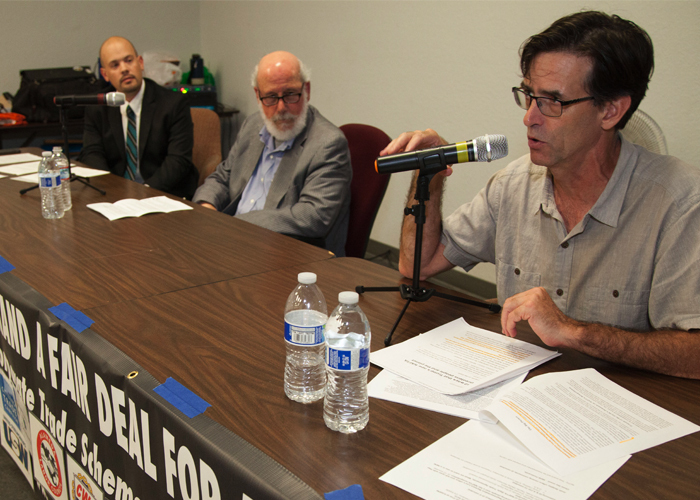 Oakland, CA — The California Trade Justice Coalition hosted a panel of local experts at CWA Local 9415 on Thursday, August 31st for a forum on the pending renegotiation of the North American Free Trade Agreement (NAFTA). The timely hearing comes just as the first round of NAFTA negotiations formally closed last week, the outcome of which is likely to have major implications for California’s economy, as well as President Donald J. Trump’s political fate. “After seeing the Trump Administration shut everyday Americans out of the NAFTA renegotiation process, we decided to hold a public hearing that would allow local leaders and working families to share their experiences under NAFTA and their visions for a NAFTA replacement.” said Will Wiltschko, Director of the California Trade Justice Coalition. The testimony featured comments from diverse witnesses from labor, environmental, immigrant rights and other organizations, who described NAFTA’s harmful impacts on the livelihoods of Californians and our neighbors in Mexico, as well as needed reforms in a NAFTA replacement deal. Most called for greater transparency in the NAFTA renegotiation process, and expressed concern over the lack of transparency seen so far in the renegotiation process. “We can’t afford any more secret trade deals like NAFTA that hurt millions of working families North America and the Bay Area. Workers deserve a seat at the negotiating table, regardless of who is President, because all politicians have to be held more accountable for trade deals that benefit corporations at the expense of citizens,” said Chris Castaing, ILWU Local 6 Secretary-Treasurer in Oakland. “Economic crises provoked by the North American Free Trade Agreement and other economic reforms are now uprooting and displacing these Mexicans even in the country’s most remote areas, where people still speak languages that were old when Columbus arrived from Spain. NAFTA, did not lead to rising incomes and employment, and therefore, it did not decrease the flow of migrants to the U.S. Instead, it became an important source of pressure on Mexicans to migrate.” said David Bacon, Author and Photojournalist. The White House formally released its NAFTA renegotiation plan on July 17th, roughly a month before the first formal round of NAFTA’s renegotiation took place in Washington, DC from August 16 to 20.